The Canaries seem ridiculously remote until you see the RyanAir map of all the places you can fly in from. And when you arrive, you're surrounded by non-local sun-worshipers: old, grey-haired, frequently gigantic, sun-worshipers. I was told that 90% of the tourists in the south of Fuerteventura island are German, and 90% of the tourists in the north are British. I was chillin' with the Germans, and they party to a different set of rules than old folks where I live. I didn't know if they were filming "Grandma's Gone Wild" or auditioning for "The Biggest Loser, Germany Edition." Since I care about you, I'm not posting any photos of the octogenarians flying their freak flag, walking down the beach with all their bits waving in the breeze. You can thank me later. The tourist development I saw didn't wreck the place - only the places where they developed. Grand soulless non-communities with no center and little apparent culture. Since I wasn't driving I didn't do much exploring other than walking. But on the hour-plus bus rides in and out of the airport I got the feeling that there is a soul to be had - just not much in the resort-centric development areas. The islands weren't named after the birds - it was the other way around. Ancient Greeks wrote about the islands, and they were a common stop-off for the Spanish when they were crossing the pond to their American holdings. In fact, Christopher Columbus stopped there on his way to getting an American holiday named after himself. (Those Indians must have been so happy to have finally been discovered!) The islands became a major hub for the slave trade, and it also represented a milestone of sorts in slavery liberation when Pope Eugene IV in 1435 announced that newly converted Christians could not be made slaves. If they didn't accept Christianity? You're on your own, pal. The islanders were heavily taxed and many were sold into slavery; Maciot also recruited them for abortive raids on the remaining three independent islands. He then capped it all off by selling to Portugal his rights – inherited from his uncle – to the four islands. This move prompted a tiff with Spain, which was eventually awarded rights to the islands by Pope Eugene V. Low-key rivalry continued for years, with Portugal only recognising Spanish control of the Canaries in 1479 under the Treaty of Alcáçovas. In return, Spain agreed that Portugal could have the Azores, Cape Verde and Madeira. Tomorrow night I'm flying to India, where my sarcastic musings will no doubt take a turn for the different. After some days in Delhi I'll be volunteering with some friends for three weeks at a leprosy community in central India. I'm ready for that, me thinks. Why do we call food "succulent" when we wouldn't want most succulents anywhere near our mouths? Umm, this looks like a tasty morsel. You first! A rare moment with not many people around. I presume this was intentional. The ocean and beaches are incredible. Fuerteventura island is very much like dry and rugged Baja California, while some of the other Canary Islands are in the Gulf Stream and are a lush green. The island is a major destination for wind surfing and kite sailing. I met a guy on his second day of lessons, and he was getting pretty frustrated. I gave him a pep talk, since he was learning for both of us. Rugged mountains in the background. Clothed beachgoers in the foreground. A dramatic sunset, with a brother and sister playing in the waves. Two more reasons to be vegetarian, in my book. At the end of town a walkway led to a church and viewpoint. I caught a photo of a ghost walking along the waterfront. The sky looked to be almost black to the naked eye. Sunsets are kind of cliche for photography, but I can't help it. The working lighthouse in Jandia. Street lights normally give off a very photography-unfriendly green-ish light. This photo had the natural sunlight and the goofy street lights. Nice contrast, in a strange way. You really ARE special! Just like everyone else. From the water's edge, facing the lighthouse and town. 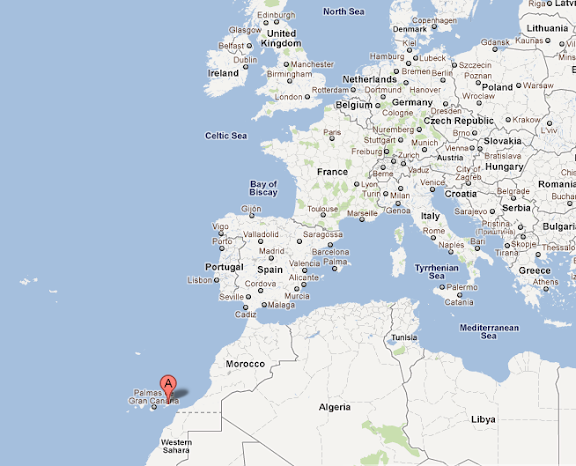 I included this so you could see how far south the Canary Islands are. The Google Maps link is here. Personalized tourist photos, courtesy of the German government! How friendly is that?! These came in the mail at Brigitte's house last year, kindly noting that my speed was just over the allowable limit. Snapshot fee: 15 Euros, or about $20.